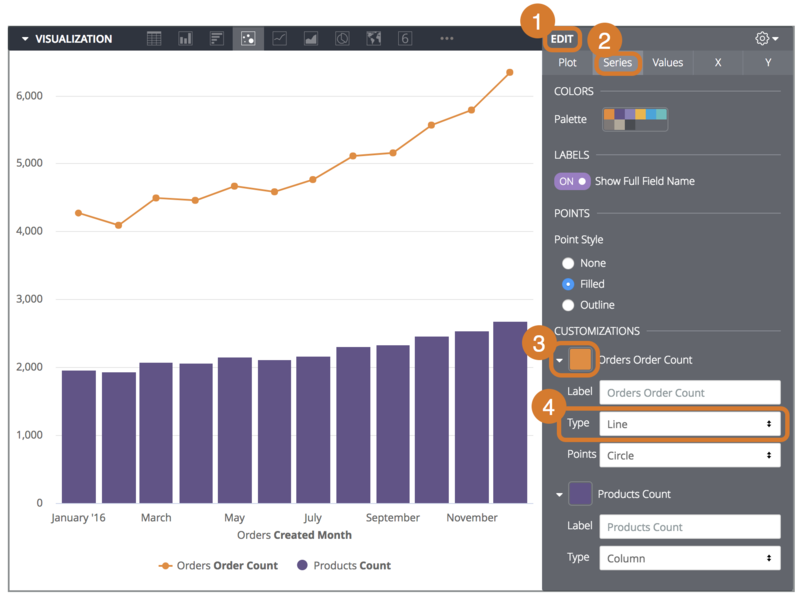 Discover makes it easy to create graphics and charts based on the results of a query. This page explains how to create visualizations that best show off your data. 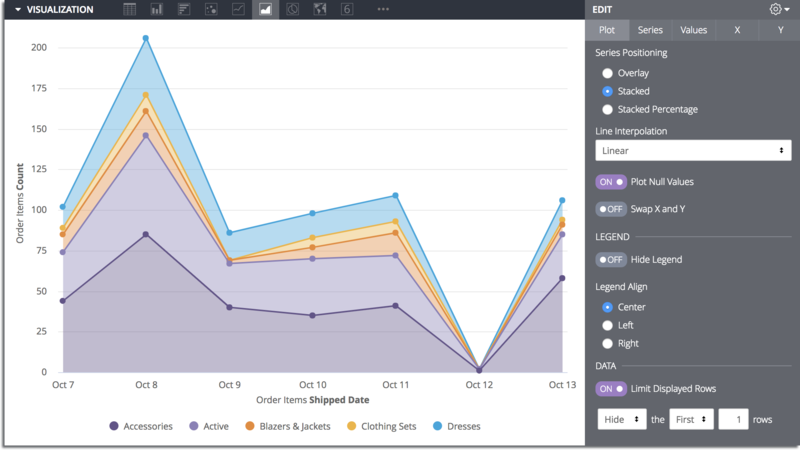 After reading this page, you’ll be able to create and configure charts. Discover keeps query details and visualization configuration data together, so when you share a query, recipients get the picture as well as the data. You can add an eye-catching chart to any query result set on the Explore. This page shows how to create visualizations that best show off your data. Create and run your query. Click the Visualization tab to start configuring your visualization options. Select the type of visualization that best displays your data. For more options, click … to the right of the displayed visualization options. 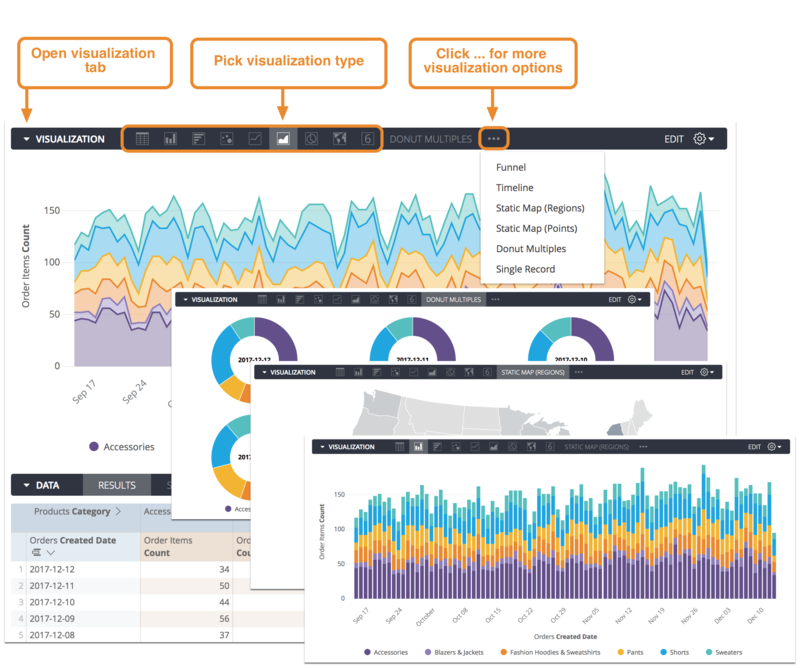 Click Edit to configure the visualization option settings, such as naming and arranging chart axes, choosing the position and type of each data series, or modifying the chart color palette. You can further customize your visualization by specifying which dimensions and measures you want to be included in the visualization. If your data is missing key values, you can tell Discover to fill in those values on the appropriate part of your visualization. Once you’ve created and run your query, click the Visualization tab in the Explore to configure visualization options for the query. Use the chart buttons to pick the visualization type that’s right for the data. The visualization type you select determines how the data series are represented in your chart. A data series is a set of related data points plotted on a chart. For example, the number of orders placed each day for a set of dates is a series. In a column chart a series is represented by columns of the same color, in a line chart, a series is represented by a single line, and so on. You can see a list of the series for your chart in the series menu, and also on the chart legend. 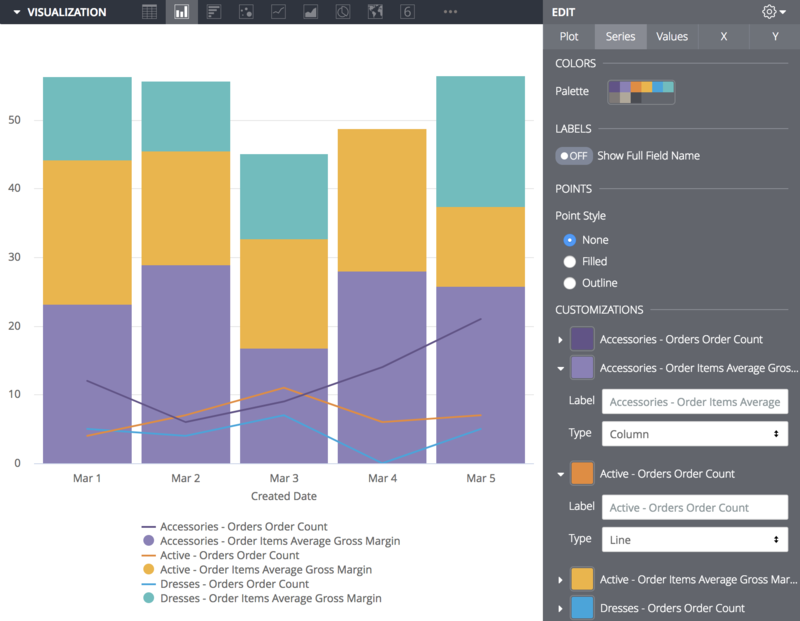 Learn how to customize your visualizations with the Discover features below. You can customize a visualization to make the data more readable and to add visual styling. Click Edit to see the visualization options, then change the settings to get a result that suits you. To see the visualization options available for a particular visualization type, click that type on the Visualization Types documentation page. The example below shows some of the visualization settings chosen for an area chart with stacked series. Click the Edit button to show the chart customization options. In the Customizations section, you’ll see an entry for each series in the chart. Click the arrow next to the series you want to change to display its customization options. In the Type box, select the type of visualization to use for that series. Charts with multiple series types always layer line and scatter series in front, then they layer area, column, and bar series. You can alter the layering order of column, bar, and area series by changing the series’ positions in the data table and clicking the Run button. The leftmost series will layer on top and the rightmost series will layer on bottom. 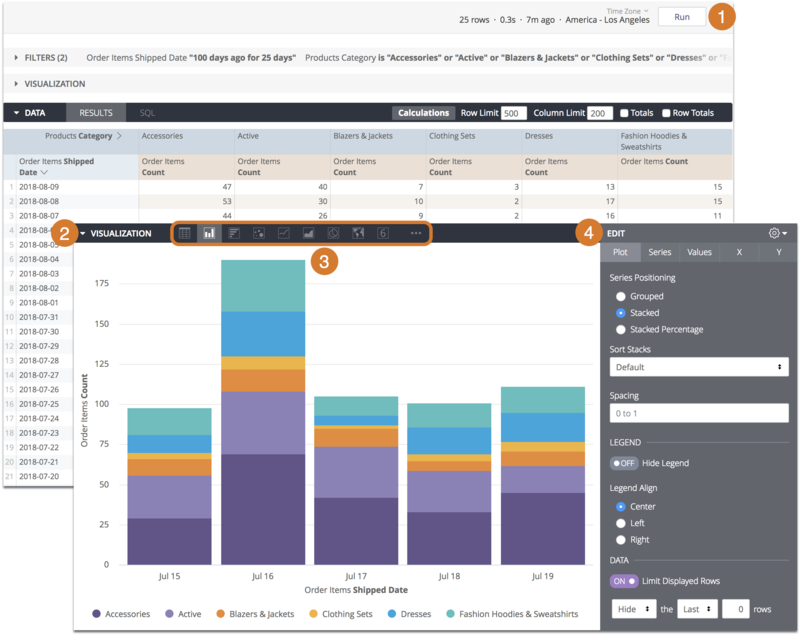 You can include stacked series in a chart with multiple visualization types. All the series of the same type as the chart overall will be stacked together; series of other types will not stack. For example, the chart below is a column chart, so the columns stack, but the line series do not stack. To create a stacked chart that uses multiple y-axes, drag any series to a different axis in the Ymenu. The stacked series will appear together, but all other series can be moved independently, including individual series within a pivot. This will hide the column from the visualization. 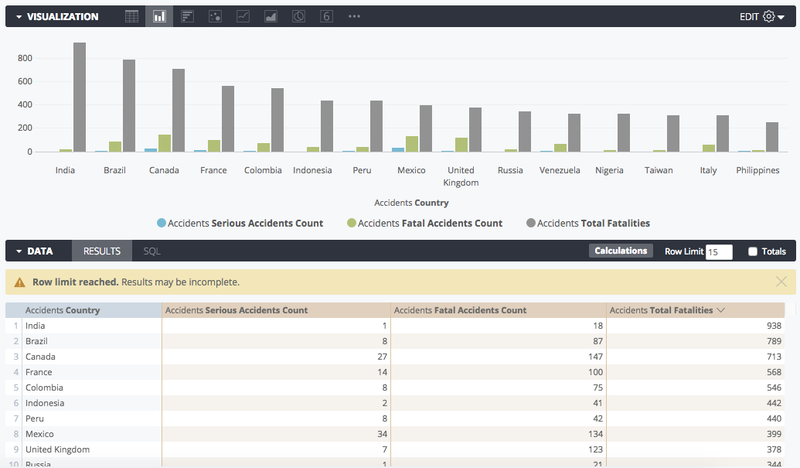 In the example below, the LookML field Accidents Total Fatalities is hidden from the visualization, leaving only Accidents Serious Accidents Count and Accidents Fatal Accidents Count in the chart. You can also enable or disable a charted series by clicking on that series in the visualization’s legend. When disabled, the series color turns grey in the legend and the data disappears in the chart. Click the series again to re-enable it. Table calculations can also be hidden from a visualization, as described on the Using Table Calculations page. Some datasets have values, such as dates, that follow a predictable pattern. A user might pull data by a timeframe and find that some dates, weeks, months, or other date types don’t have any corresponding value. 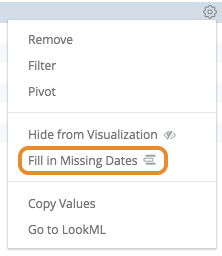 By default, the data table and the visualization will display dates returned from the query and skip any dates that are missing. 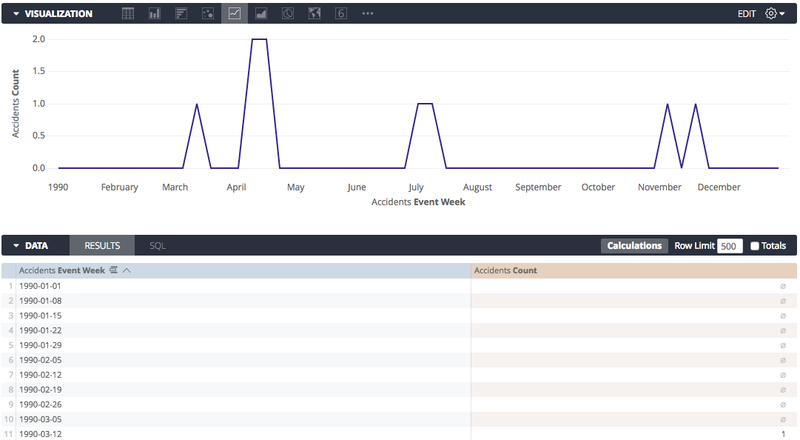 Discover’s “dimension fill” option lets you display the missing dates or other values in the data table and on the corresponding axis of the query’s visualization. This option is found in the dimension’s gear menu in the Data section of an Explore. Dimension fill is available for dimensions with yes/no values, tiered values, and most date types. It can also be applied to any dimension based on a list of values, via the caseparameter. Dimension fill will turn on automatically for queries that run with a single dimension and/or a single pivot, just as long as you haven’t applied filters to any measures. Dimensions that have a filter applied to them and also have a fixed number of values, such as yes/no, days of the week, days of the month, etc. Drilling into a pivoted dimension. Dimensions where your Discover developer has used the order_by_field parameter or disabled the allow_fill parameter.